Davos meeting good opportunity to make Nepal widely known - Integration Through Media ....! Tirtha Bhattarai, KATHMANDU: One of the members of the Nepali delegation participating in the World Economic Forum, also known as Davos meeting, has said the participation in the Davos meeting was an opportunity to make Nepal known to the world. 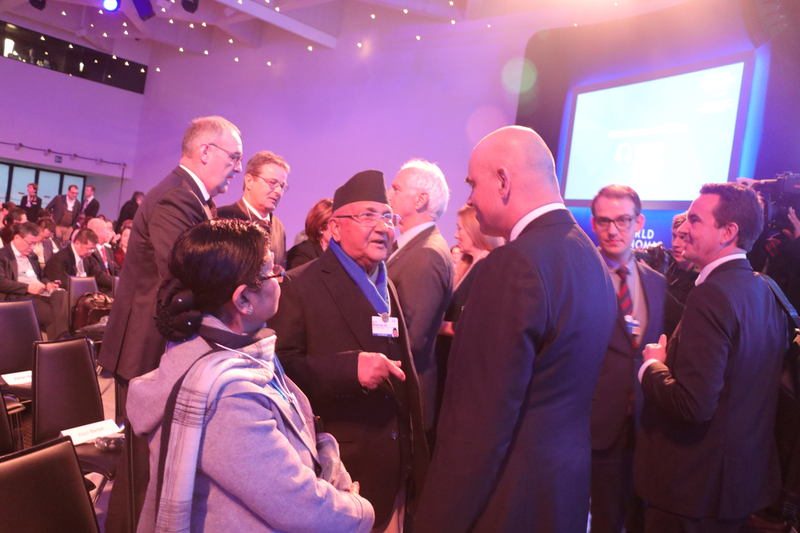 The delegation member and Foreign Affairs Minister Pradeep Kumar Gyawali said the world was shared about Nepal’s situation by the Prime Minister KP Sharma Oli with the Davos participation. “It was an opportunity to share with the global community about Nepal’s efforts for prosperity and deepening of democracy,” he added. According to him, the foreign investors were assured that Nepal had no more conflict, so that none had to doubt the environment. Similarly, another member of the delegation Finance Minister Dr Yuba Raj Khatiwada observed that the Davos meeting was an unprecedented platform to share with the world about Nepal’s political and economic status, environment for economic activities and investment. He reminded that during his talk to a Japanese telecommunications company, the company showed interest to invest in Nepal. In response, he said he would facilitate for their investment, added Dr Khatiwada. “Nepal’s participation in the Davos meeting became successful to give a message that Nepal has brought reforms in tax, customs and foreign exchange and the formulation of law,” he underscored. Vice Chairman of the National Planning Commission, Prof Dr Pushparaj Kandel also seconded the Finance Minister that the Davos meeting was fruitful to inform the globe about Nepal’s political stability, investment climate and potentials. Moreover, Prime Minister’s Advisor on foreign affairs, Dr Rajan Bhattarai, said Nepal would reap much benefit from the Davos participation. He reminded the Prime Minister’s bilateral meeting with the Vietnamese counterpart and the talks to expand relations between the two countries. The two countries are of the view to exchange meetings. Vietnam assured that it could invest in Nepal if the investment atmosphere was created in Nepal, he added.